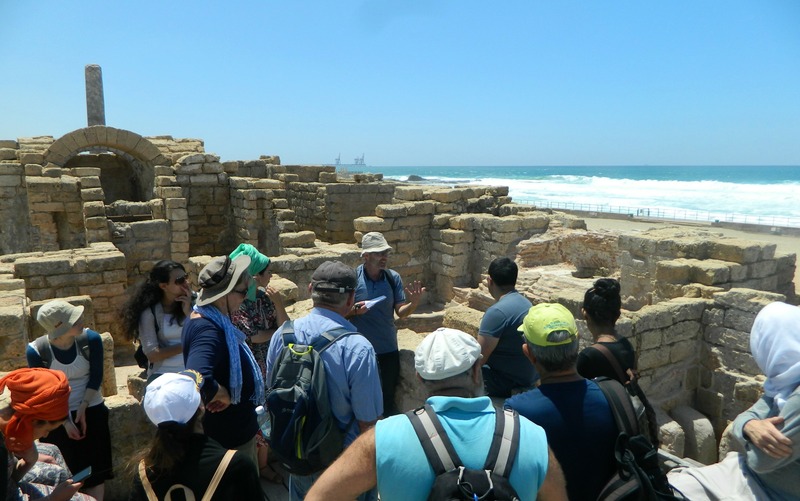 Two months or so ago I joined fellow archaeology students on a tour of Caesarea and the further ends of its iconic aqueduct. Boarding the bus at Bar Ilan University we drove up north to the national park and began our tour overlooking the surf in relatively comfortable morning weather. After a fantastic video (reminiscent of my favourite childhood computer game, Civilization III) summarised the historical successions of the ancient Roman city, we popped on over to the aqueduct remains on the coast. 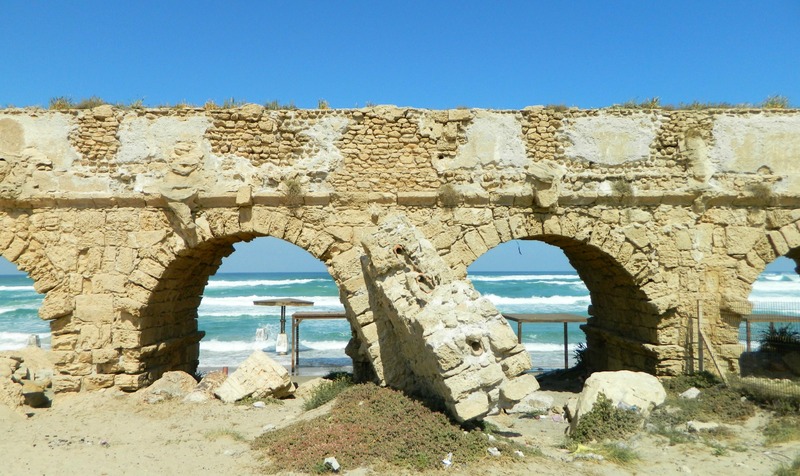 In one of my courses we spent a class or two learning about this particular aqueduct, of which there are actually three subsequent water systems – Roman construction by both Herod and Hadrian built side-by-side and then Crusader on top. 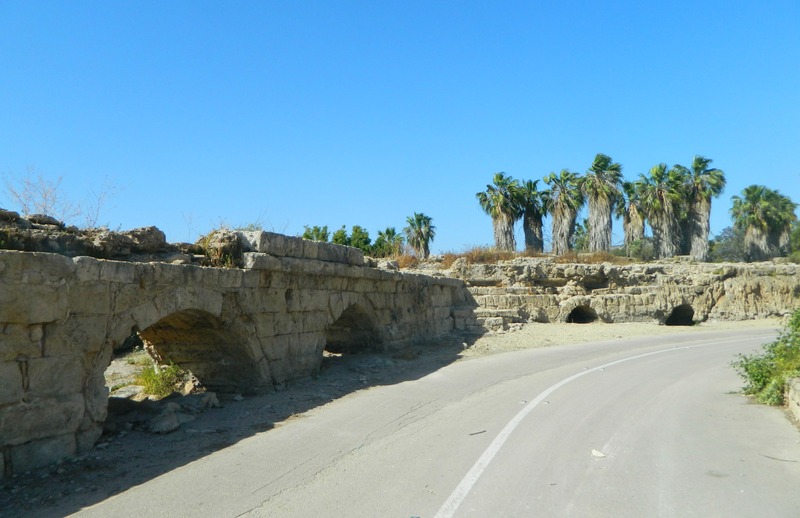 Bringing water in from springs near Zichron Ya’akov, the aqueduct supplied the Roman city Herod built in the name of Roman Emperor Augustus Caesar, his sovereign leader. Examining the varied constructions from an academic standpoint, we then walked along the beach to see the engraved plaque stones marking the building and dedication of the aqueduct. 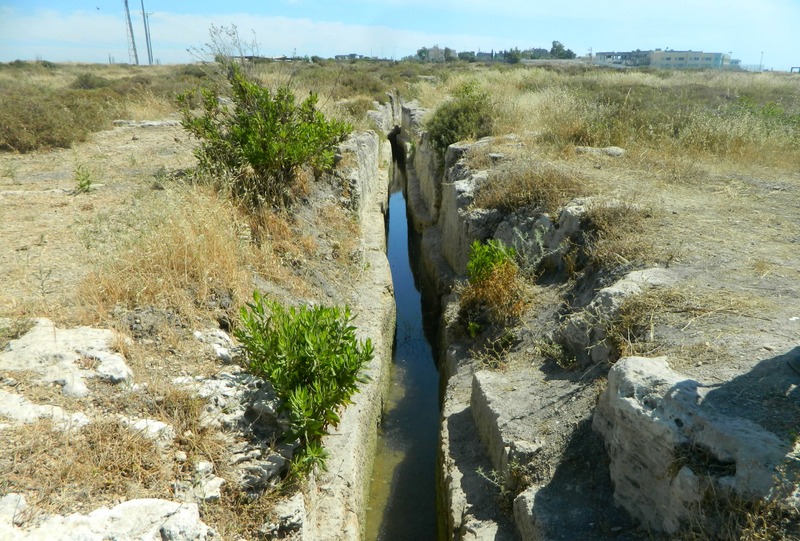 We then walked to the lesser known smaller aqueduct, built during the Byzantine times, which brought water from the marshes several kilometres north – a project that was abandoned before it finished. 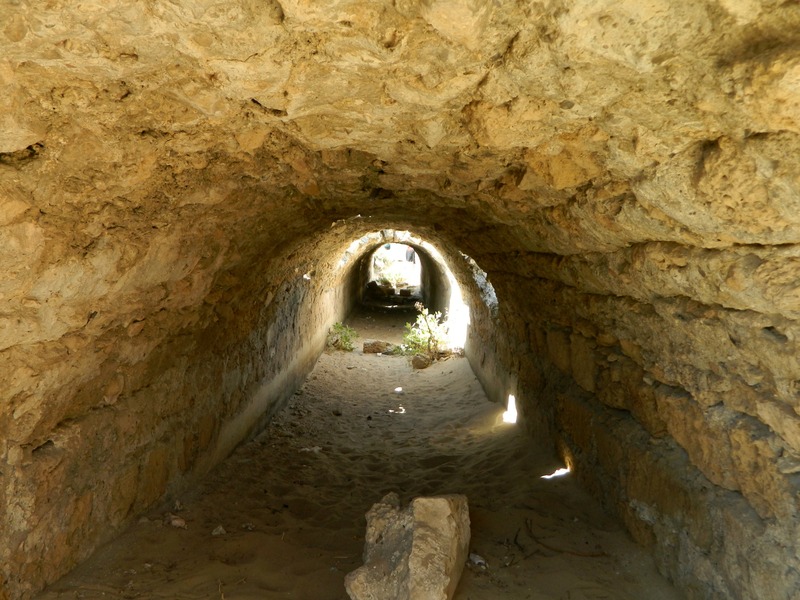 We climbed up into the aqueduct and crouch-walked our way a bit through the water tunnel before continuing on southward towards the ancient city ruins of Caesarea. 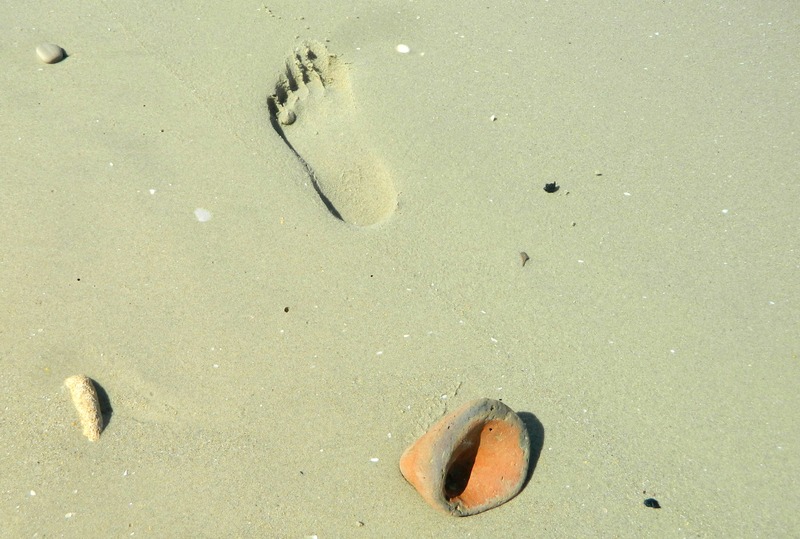 The walk was a bit of a doozy but along the way I found the base of an amphora washed up ashore, one of many pottery finds. We stopped just before the northern city wall from the Roman era and listened to a brief lecture looking over the surf. 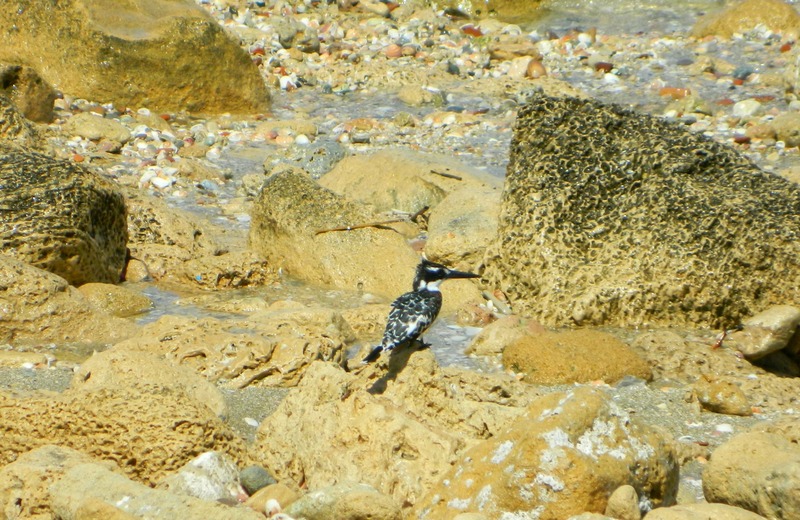 As we stood in the hot sun listening I noticed a few pied kingfishers hovering above the surf, a bird I love watching. Once through the northern gate we passed ruins and a small sampling of a mosaic floor, one of many in Caesarea. Crossing the Crusader-era moat and sloped city wall, we shortly entered the heavily-commercialised city centre – transformed into a tourist trap with restaurants and shops. We took a break from walking and had lunch just outside of the Roman nymphaeum – a public fountain with its statue of a Roman goddess. 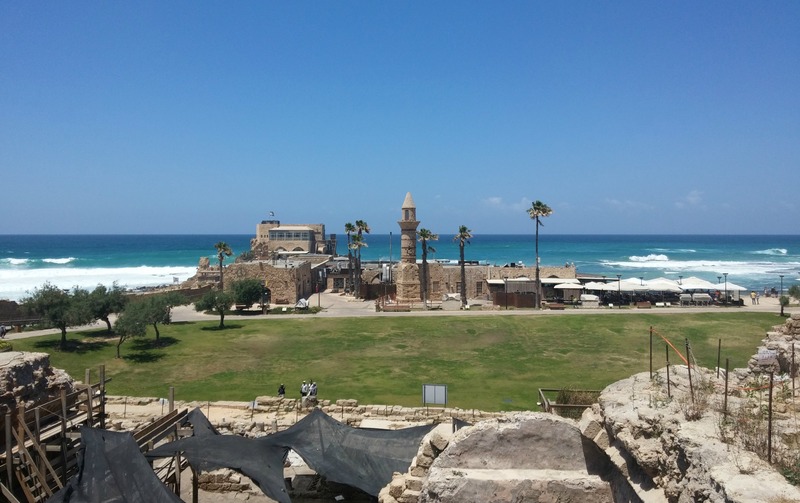 Walking over to the Crusader port, we passed temples and various administrative buildings and climbed the Roman citadel to look down on the ancient harbour, watching another fabulous animated film about the harbour area. 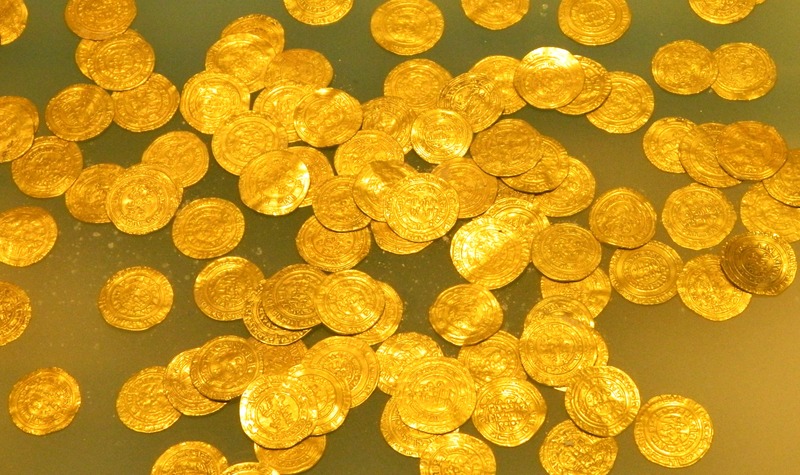 In one of the local buildings we came across the exhibit for the gold coin trove that was discovered in the spring of 2015 by scuba divers underwater – the largest hoard of gold coins found yet in Israel. Heading inland we watched some ongoing archaeological dig and restoration work of the Herodian harbour vaults while looking down at the Crusader citadel and neighbouring Bosnian mosque minaret. Continuing ever southwards we entered the Roman bathhouse complex and marveled at the marble pillars and extensive tiled floors. 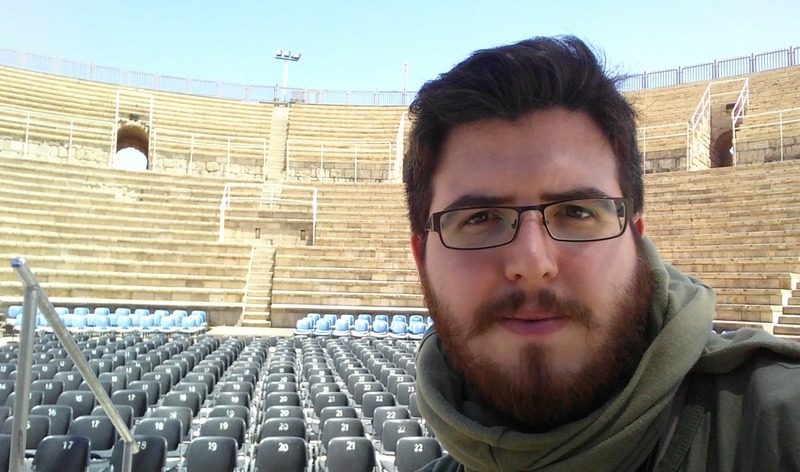 Looping back a bit, we entered the long dirt-floored hippodrome, a Grecian stadium for horse races. 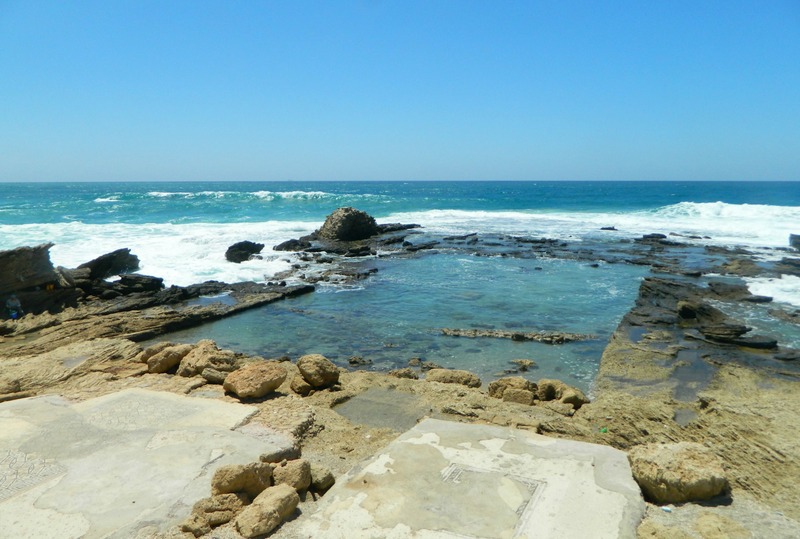 Passing the Mithraeum and other public buildings we reached the far end of the hippodrome and ventured over to see the meagre remains of Herod’s palace, built jutting out into the Mediterranean Sea. From there we headed straight for the Roman theatre which, as wonderfully preserved and lovingly reconstructed as it is, continues to provide entertainment for the populus as a premier location for concerts. I took the liberty of snapping a photograph of myself sitting on the stage. Despite the length of our tour thus far, we were nowhere near finished. Boarding the bus we were then driven to Nachal Taninim, the marsh area which supplied the water for the smaller of the two aqueducts entering Caesarea from the north. The name Nachal Taninim, which literally means Stream of Crocodiles, originates from the now-extinct population of crocodiles that lived in the stream and marsh’s brackish water. Thought to have been originally imported for entertainment by the Romans from nearby Egypt, the last crocodile was killed by the British approximately 100 years ago. In the 300s CE, a city was established on the banks of the stream under the name Crocodopolis – my favourite ancient city name. 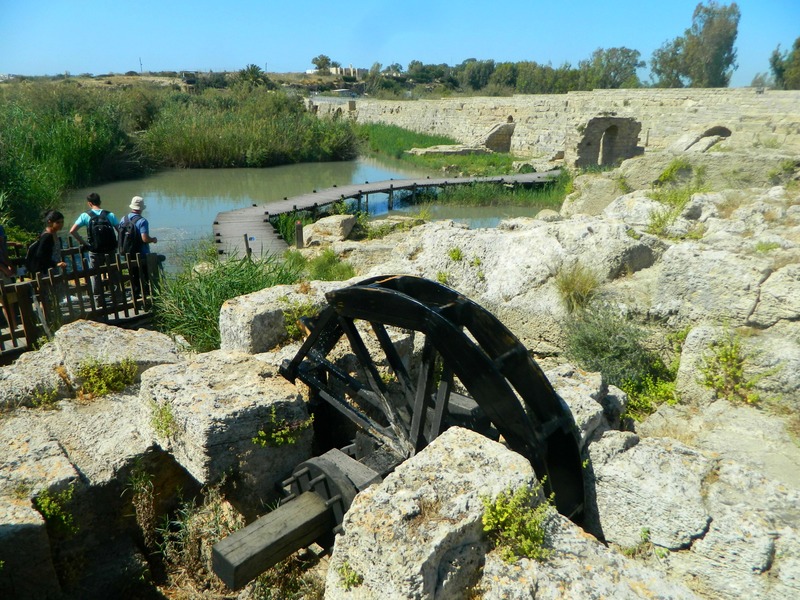 The Byzantines took the large marshy area and built dams and a regulatory system to control water flow, in efforts to power mills. A park ranger took us to the dam and showed us how the reconstructed waterworks was used in ancient times – the simple power of water always amazes. We spotted crabs and frogs in the water, and several waterbirds as well, as we made our rounds through the national park. 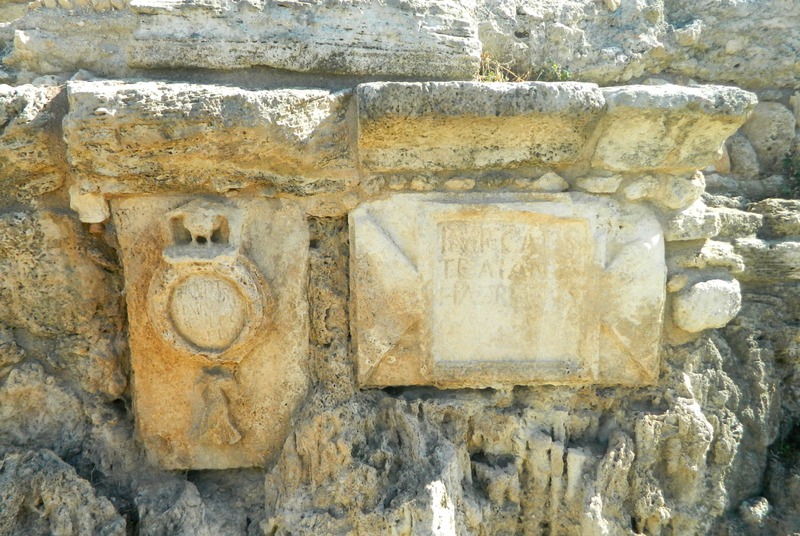 From Nachal Taninim we boarded the bus to see one last sight, the Roman aqueduct bend at Beit Hanina which includes a dedication plaque etched into stone. We finished up the long day-trip with a wall along the top of the aqueduct, admiring the clay piping laid into the rock. From there the aqueduct continues into the modern Arab village of Jisr al-Zarka and then along the coast where we started the day. 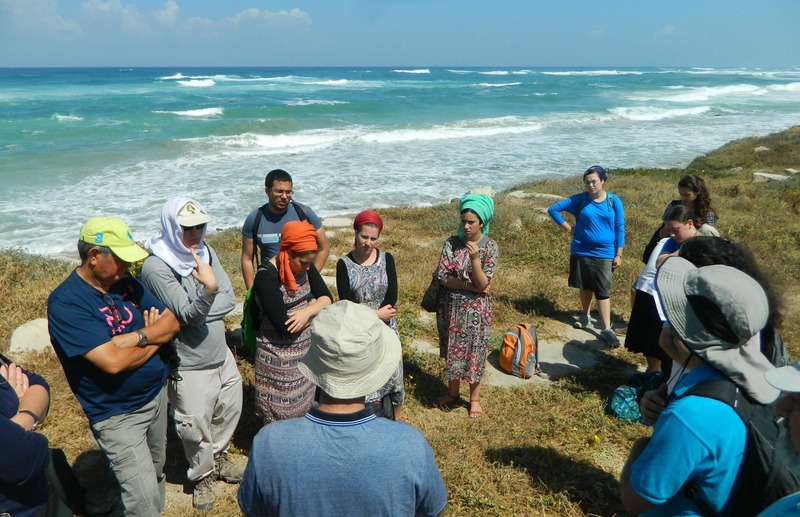 We headed back to BIU sunburnt but having had a wonderful time exploring the much-discussed ruins with the professors, looking forward to the next trip.